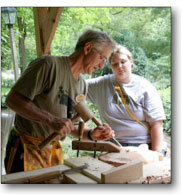 The Spoon Carving Website by David Knight explores working with green wood using axes and knives. 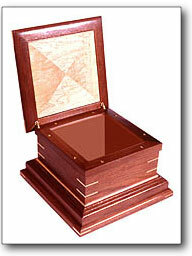 The goal of the Northwest Woodworking Studio is to promote the art and craft of fine woodworking. This is a traditional crafts approach for building functional pieces of work that will last for generations. Woodlanders is a network of people who work with the generosity of the trees and the earth. It grew from the teaching work of artist and author Daniel Mack. In the fifteen years of teaching about rustic building, he noticed that a bigger and bigger part of each course was the need for like-minded people to just visit with each other, to share stories and be in the company of people who had similar passions for natural forms. The Woodworking Catalog -- A collection of information useful to woodworkers including The Woodworking Times on-line magazine. The Electronic Neanderthal -- One of the best resources on the web for traditional woodworkers. Has many, many links -- an excellent place to find out what's available on the web related to woodworking. Fine Woodworking ... Online version of Taunton's popular magazine. Whether you're a professional woodworker or just starting out, you'll find practical information about the techniques, tools and materials that go into your work at their site. Better Woodworking Guide & Directory - Helping folks to be better woodworkers with instant access to the information they need. 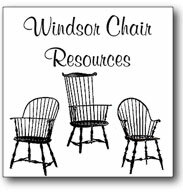 Windsor Chair Resources is a clearing house for information on Windsor chairmakers, classes, tools, books, etc. American Woodworker is a leading woodworking magazine that features complete how-to information which details cutting lists, the best tool buying advice, and innovative woodworking techniques to help ensure your project's success. The About Woodworking site is devoted to woodworking topics for beginner to professional wood enthusiasts. Aside from sharing topical information with a large group of diverse visitors, their goal is to feature products/services/ideas that benefit the woodworking community at large. They also send out a biweekly newsletter that covers recent additions to the web site, as well as featured articles and contests. There is a bulletin board where members can chat/post questions and a large collection of project plans for every skill level. Pinewood Forge is the website of knifemaker Del Stubbs. Besides a catalog of his products, Stubbs offers sharpening tips and photos of carved spoons. WOODezine is an online magazine devoted to woodworking. Bed and Breakfast at Ponder Cove is the ultimate dog-friendly luxury country Inn in the Asheville area. Transform to a peaceful state in this natural setting as you enjoy a long soak in your private whirlpool, the comfort of a wood burning stoves or the delights of a home cooked breakfast. Marshall High Studios is a really impressive project that has been done by Rob Pulleyn, ex-owner of Lark Books. Craft-Search is a directory of craft-related links. Grove Arcade: Shopping, dining and regional crafts in one of Asheville's architectural jewels. Asheville Now has listings of everything going on in and around Asheville, N.C.
British Woodworking publishes "Living Woods Magazine" and "British Woodworking"
The Furniture Society is an organization dedicated to advancing the art of furniture making. Lie-Nielsen Toolworks makes more than 100 types of planes, saws, spokeshaves, chisels, floats and more.